Kuching, 15 June 2013. 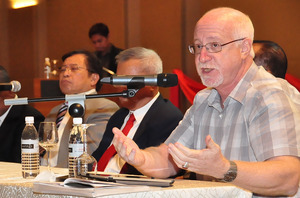 Gerald Seligman, the former General Director of WOMEX (the largest World Music Expo) has been appointed consultant of the Borneo World Music Expo. The inaugural Borneo World Music Expo will be held on 24 to 26 June 2013 at Pullman Hotel Kuching. With high profile Seligman on board, Sarawak Tourism Board is promoting the exposition to position Sarawak as a destination for art, culture and music. Seligman, President of Caravan Arts Consultancy, has 25 years of music experience under his belt in both major and independent music plus music event companies. Until November of 2009, Seligman was General Director of WOMEX, the largest World Music Expo. He founded and ran EMI Hemisphere, the company's premier world music label, and was head of EMI's international sector for Strategic Marketing that produced or compiled over 100 releases, including one with a Grammy nomination. The Borneo World Music Expo is a new initiative in addition to the already successful Rainforest World Music Festival. This is a new international world music conference organised by the Sarawak Tourism Board to coincide with the Rainforest World Music Festival (RWMF). The expo is specifically designed to expose Asian and ethnic musicians to the international market. Scheduled to be held a week before the Rainforest World Music Festival every year (28-30 June this year), the expo will integrate a trade fair, musical showcases, conferences, exhibitions and networking sessions which would promote the culture and music. "We are glad that the renowned Mr Seligman has come on board to lend his expertise to this expo," revealed Ms Angelina Bateman, Director of Corporate Affairs of Sarawak Tourism Board. She added that the event would raise the Meeting & Exhibition market segments related to music in the context of business tourism events. It is the ambition of the Sarawak Tourism Board to grow the Borneo World Music Expo into a world recognised annual exposition for the professionals and trade visitors within the international music scene. The expo would be the first of its kind to be organised in South East Asia. It is organised by Sarawak Tourism Board and is supported by Malaysia Convention & Exhibition Bureau (MyCEB) as well as Sarawak Convention Bureau (SCB). Musicians, managers, record labels, festival presenters, music venues, music professionals, cultural ministries, entrepreneurs, and technology companies can participate by registering through the BWME website online at www.BWME2013.com.